Today's Image of Mars is of 'Greeley Haven,' the site for Mars Exploration Rover Opportunity's fifth winter resting point. 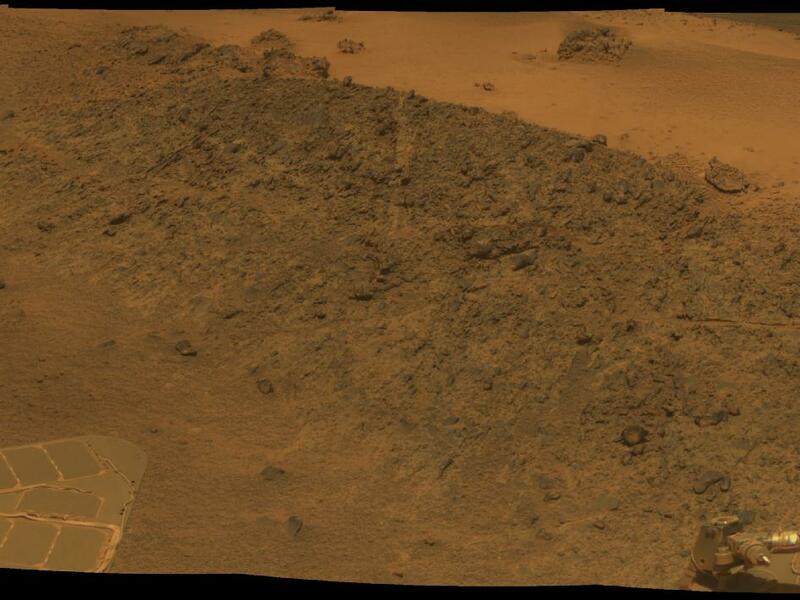 Greeley Haven in near the northern tip of the Cape York segment of Endeavour Crater. Greeley Haven was selected by the MER team because of its interesting geological features and the fact that it lies on a North facing slope. Opportunity needs to spend the winter on a north facing slope in order to optimize its solar energy. From this position Opportunity will take a 360° panorama of the surrounding area. The Mars rover will also study the terrain and material of Greeley Haven. This image was taken on Sol 2793 of Opportunity's mission, which was on December 2 2011. Clicking on the image will take you to the original captioned image from NASA. Labels: Endeavour Crater, Greeley Haven, Mars Photo of the Day, Mars Rover Opportunity, winter on Mars.